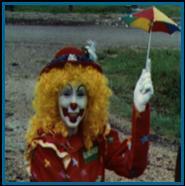 Gumdrop has been a party clown for over 29 years and has performed in over a thousand events. Her performances include parades, festivals, company picnics, grand openings, birthdays and seasonal parties. Gumdrop has been seen in numerous TV shots. She has appeared in all the local newspapers. She has worked with many other professional clowns and was even the street jester in the Beaumont Community Players 1990 production of “Scrooge”. Gumdrop taught six sessions at Lamar University’s Learning Tree Summer classes for children. She has also taught and worked with the American Red Cross Clown troop for over a year. She has taught adult, teen and children’s classes, as well as given private lessons. Gumdrop attends many classes, seminars and conventions in the art of clowning. DON’T FORGET TO SIGN MY GUEST BOOK !